It may not be obvious, but there’s a good chance that the BGE line person you see climbing a utility pole or answering your service call spent MLK Day volunteering in the spirit of Dr. King, mentors local students in reading and math, or pledges part of his or her income to the United Way. These are just three of many examples that demonstrate how BGE employees contribute to local nonprofits. 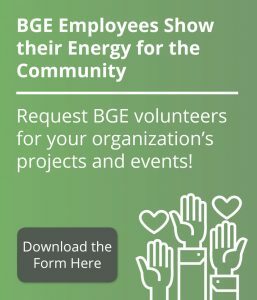 BGE, an Exelon Company, has delivered energy to Baltimore and greater Maryland residents for more than two centuries, and has always taken corporate social responsibility seriously, encouraging employees to volunteer and providing charitable grants in education, the environment, community development, and arts and culture. Sure, BGE remains committed to providing the best possible energy services, but the company is also dedicated to nurturing the central Maryland communities it serves. BGE steers $5 million to nonprofit organizations every year. With grants supporting the environment, teachers, and emergency response initiatives and donations to hundreds of qualifying 501c3 nonprofits, BGE works to lift up the communities it serves. Applications are submitted via the CyberGrants online giving platform. Grant recipients span the range of nonprofit initiatives, from the Big Brothers Big Sisters mentoring program to Art with a Heart, which brings interactive visual arts to some of Baltimore’s most vulnerable communities. Another goal of BGE grants is to support math and science education, which helps to build a talent pipeline for future engineers and scientists who may very well establish new technologies as BGE employees! Safeguarding the environment has also been central to BGE’s mission, so support for organizations like Patterson Park Audubon Center—which develops educational and restoration projects—aligns perfectly with BGE’s purpose. Employing nearly 3,200 people, BGE takes pride in its role as a community builder. The company works closely with the United Way of Central Maryland to foster community development through charitable outreach work in health and human services as well as after-school programming. A vibrant community depends on many strands of investment, so BGE helps to strengthen the arts and culture through local music and film festivals, regional theater productions, and multicultural education opportunities. BGE also shows its commitment to Baltimore-area children in many ways. The new Energizing Student Potential (ESP) program, launching this fall, is designed to bolster STEM education in Baltimore County by empowering teachers to explore energy-related STEM subjects and introduce students to careers in energy technologies. Ten Baltimore County schools will pilot the program for 5th–8th graders. High schoolers are invited to participate in the biannual Youth Energy Conference and to apply for summer internship positions. 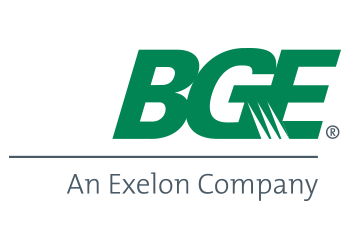 BGE hired 50 summer interns in 2018 alone. The company’s Frank Heintz Scholarship Fund annually awards $5,000 to nine local high school seniors and graduates based on their academic achievement and community service participation. Students are encouraged to apply for this award during all four years of attending an accredited institution of higher learning. Equally important to BGE’s mission is encouraging its employees to be actively involved in their community. In 2017, 25 BGE employees became “Bigs,” accepting the responsibility to be a consistent presence in the lives of 25 “Littles,” students at Maree G. Farring Elementary School in Baltimore, through the Big Brothers Big Sisters program. In this collaboration with the Y of Central Maryland, the Big volunteers meet twice monthly with their Little brothers and sisters in the BGE Spring Gardens complex, where they have lunch and discuss important life skills such as character development and even financial literacy. Not surprisingly, in 2018 the majority of the Bigs returned to mentor their Littles for another year. BGE’s initial grant commitment spans three years, and the impact for all participants will last a lifetime. The grant awarded to the Patterson Park Audubon Center Bird Ambassador program furthers BGE’s support for ecological education. Established in 1867 and added to the National Registry of Historic Places in 2002, Patterson Park offers critical stopover habitat for neotropical songbirds migrating from Central and South America. The Patterson Park Audubon Center does much more than maintain this habitat, however. It also introduces Baltimore children and families to the magic in nature. The insight and appreciation gained by Patterson Park visitors can change lives. Hands-on exploration and education programs teach people how to green their own neighborhoods, be it by recycling more or adding butterfly and bird habitats in their backyards. BGE remains a leader in environmental stewardship throughout Baltimore City and Maryland, offering Green Grants to nonprofits throughout the company’s service area. The wide array of initiatives supported cover conservation, education, energy efficiency, pollution prevention, and community engagement. The grants range from $500 to $10,000. In 2018 BGE awarded $300,000 to 69 Maryland nonprofits. Recipients included Downtown Annapolis Partnership for public recycling, Irvine Nature Center supporting urban education initiatives, and the Herring Run Watershed’s Baltimore Harbor Waterkeeper program, to name a few. Recycling and energy efficiency are also central to BGE’s mission. The Exelon EcoTeam, an employee resource group, encourages volunteers in the business community to support green business practices. 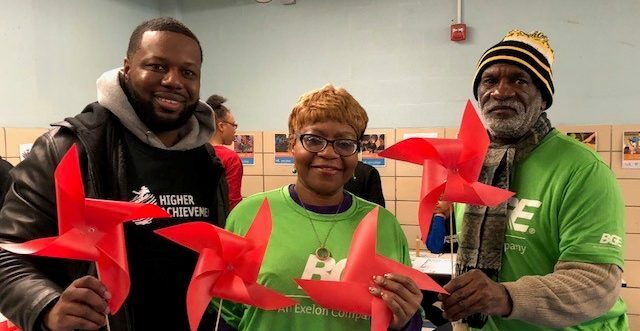 BGE employees have volunteered with numerous cleanup and recycling projects, as well as with Living Classrooms, Blue Water Baltimore, and Civic Works, among many others. In total, BGE employees commit an average of 26,000 volunteer hours annually throughout 11 counties in Maryland. In addition to the money the company donates each year, BGE wanted to create the means for employees to support a cause that directly affects them or their loved ones. In 2015, the BGE Cause Initiative was established as a result. Every December, employees can nominate a cause associated with any nonprofit organization in the health and human services. BGE’s management team reviews the three nonprofits that receive the most nominations and votes to select one. 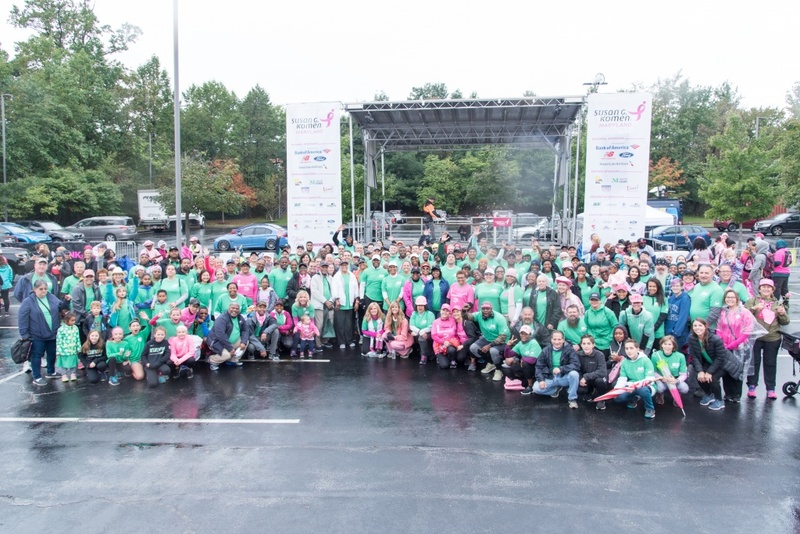 In 2018, the BGE Cause Initiative was Susan G. Komen Race for the Cure. After the cause was selected, employees raised more than $290,000 for breast cancer research. 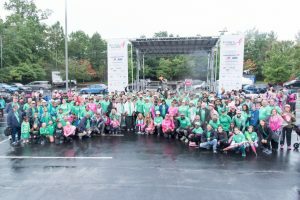 More than 400 BGE employees and their families and friends participated in the Susan G. Komen Race for the Cure held on October 13 in Columbia, Maryland. The 2018 Cause Initiative was chaired by Valencia McClure, Vice President of Governmental and External Affairs, BGE; McClure is a breast cancer survivor and member of the Susan G. Komen Maryland board of directors. Funds were raised during the Race for the Cure walk and through company fundraisers and BGE’s annual Smart Energy Open Golf Tournament. In 2019, the BGE Cause Initiative will be supporting the Cal Ripken Sr. Foundation. This organization supports at-risk youth by developing life skills and a safe place for kids to grow and thrive. Every BGE employee is a thread in his or her community’s fabric. The company is proud to support the numerous organizations here that are working to improve life for Maryland residents, from the Greater Baltimore Urban League to the National Association of Women in Construction, from nutrition programs to first-responder support services. In short, BGE is committed to making Maryland a dynamic and healthy place to call home.